Panel design can be a difficult and time-consuming process but is essential to obtaining good data. 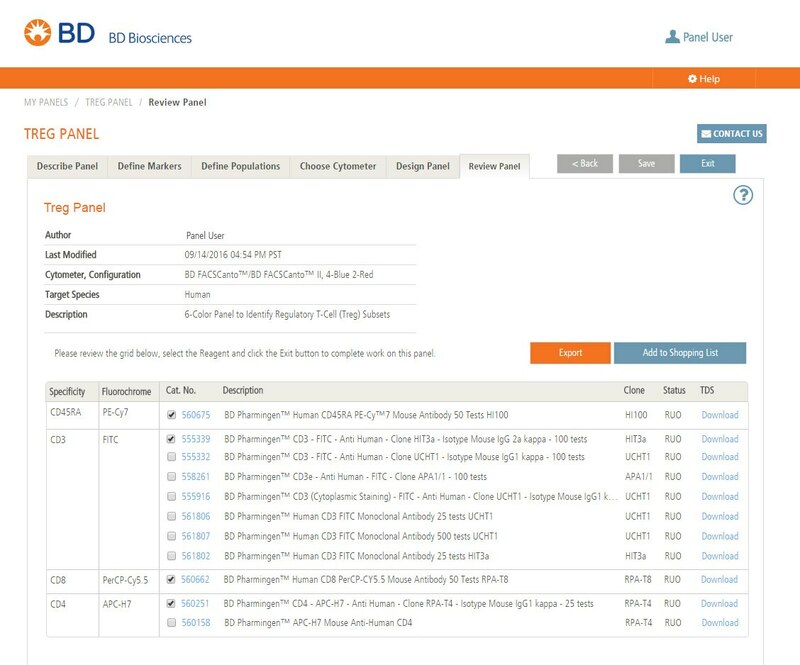 The BD Horizon™ Guided Panel Solution (GPS) provides a guided workflow for reagent selection based on the principles of panel design. 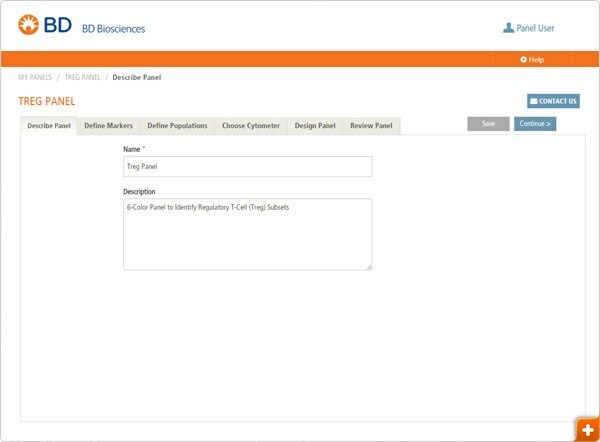 This tool will help you streamline the panel design process and avoid reagent selections that may negatively affect population resolution. There are six steps to the panel designer workflow. Each walks you through an important part of panel design. Click the steps for more information. There are also Help icons throughout the tool with additional information. Describe Panel: Name and enter important notes about your panel. 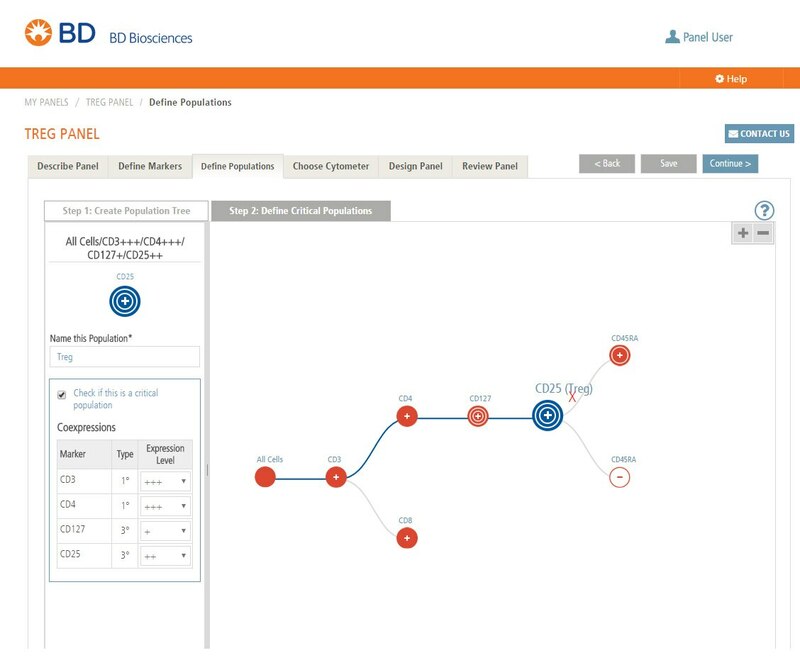 Define Markers: Enter the target species, panel markers and expression pattern of each marker. 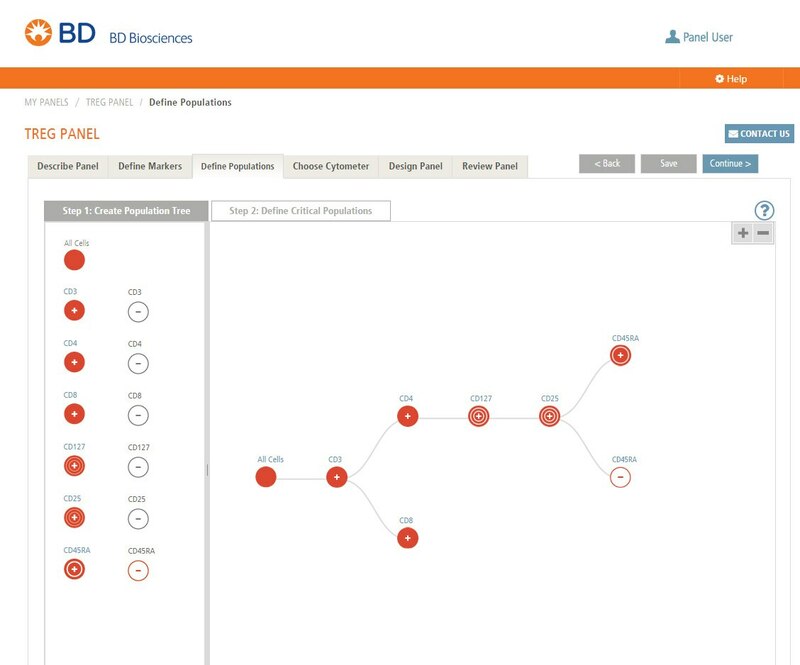 Define Populations: Create a population tree to define your gating strategy. You will also define the critical populations and the expression level of the markers in these populations. Choose Cytometer: Choose your cytometer and configuration. Design Panel: Match markers with fluorochromes. This step will also provide a message when reagents are selected that may negatively affect population resolution. 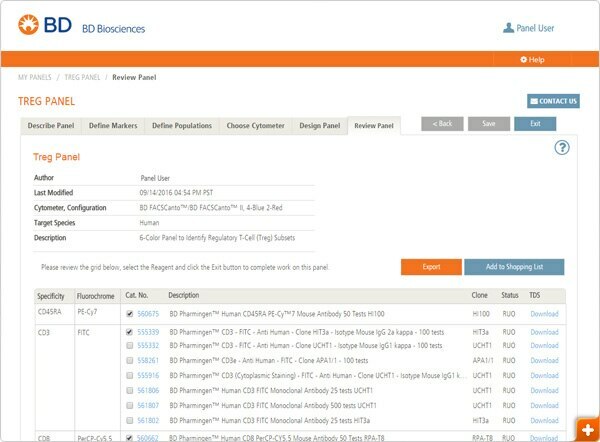 Review Panel: Display the catalog of reagents available for the selected panel. The reagent list can be exported to Microsoft® Excel and easily shared. Describe Panel: Name your panel and provide any important notes. Define Markers: Here you will enter the target species, panel markers and their "type." The reagent type denotes the expression pattern of each marker as defined here. The tool takes this information into account when determining how fluorochrome brightness and spectral overlap may affect resolution. If you have a specific clone that you would like to use, you may select it from the clone drop down menu. If you select a clone, only reagents available for that clone will be displayed. Expressed at low levels, variable upon activation unknown, critical. 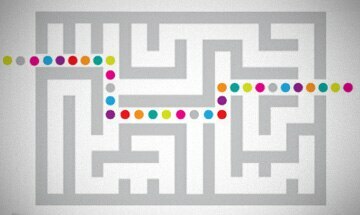 In this section you will define your gating strategy and critical populations. Critical populations are the populations that you are most interested in studying. 1. 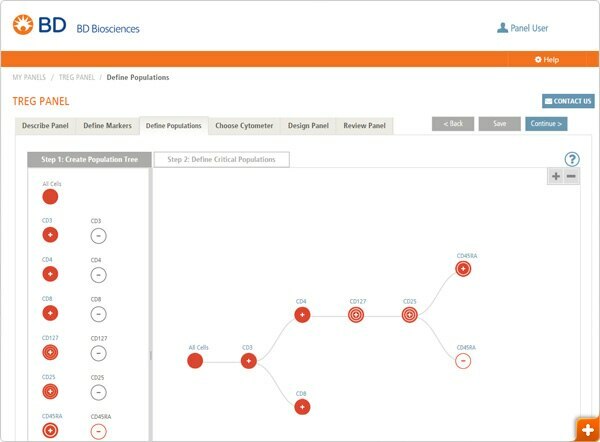 Create a population tree which will outline your gating strategy. Drag the markers from the box on the left to the space on the right to form the population tree. To create more than one branch off a tree, drag the markers on top of the node. 2. Next you will define the critical populations. 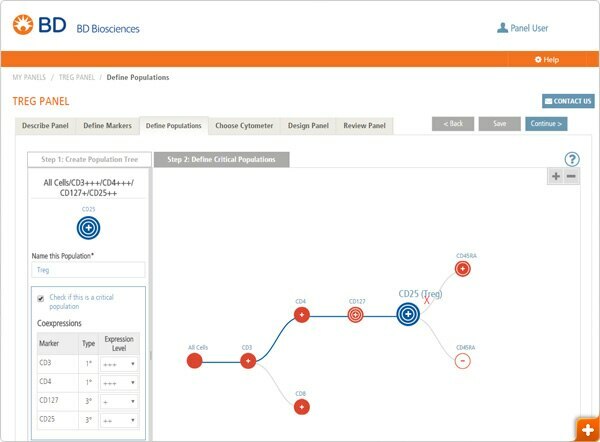 Once you click the node of the critical population, you will be prompted to name the population, select the box indicating that it is a critical population and enter the expression level of the markers expressed in this population. The expression level should represent the expression level of that antigen on this critical population. Select your cytometer from the menu. 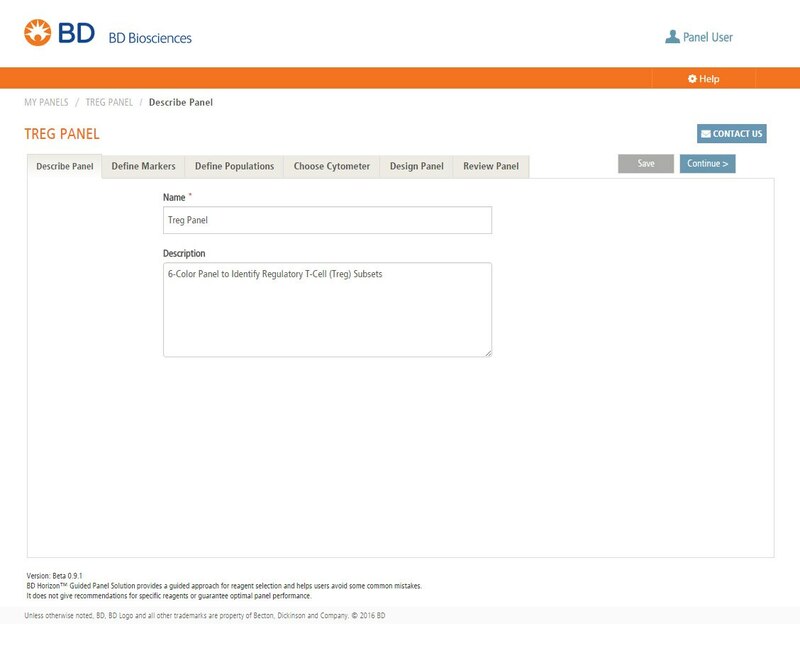 Most of the standard configurations are available from the configuration drop down menu. 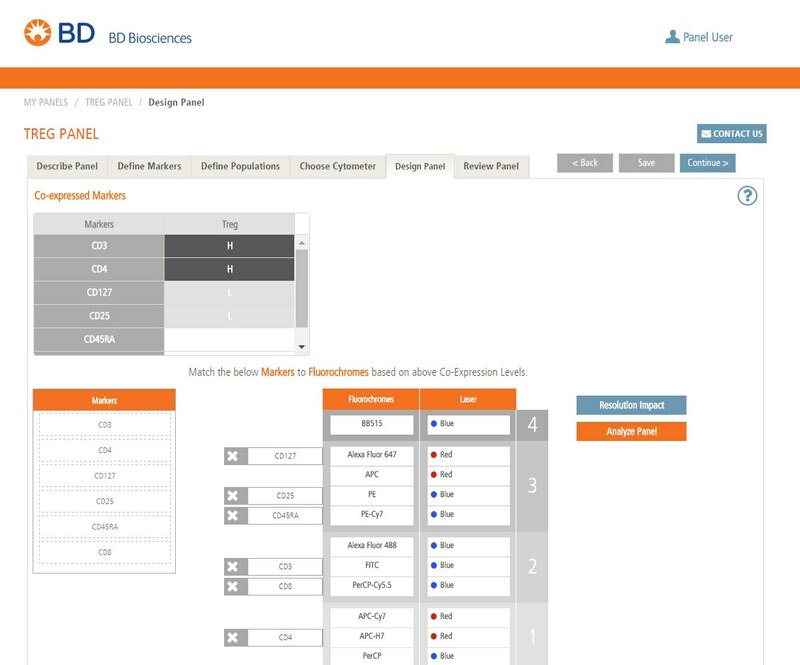 Once you select an instrument and configuration, you can modify the configuration by adding or subtracting fluorochromes. If adding a fluorochrome, you also need to note the relative brightness. 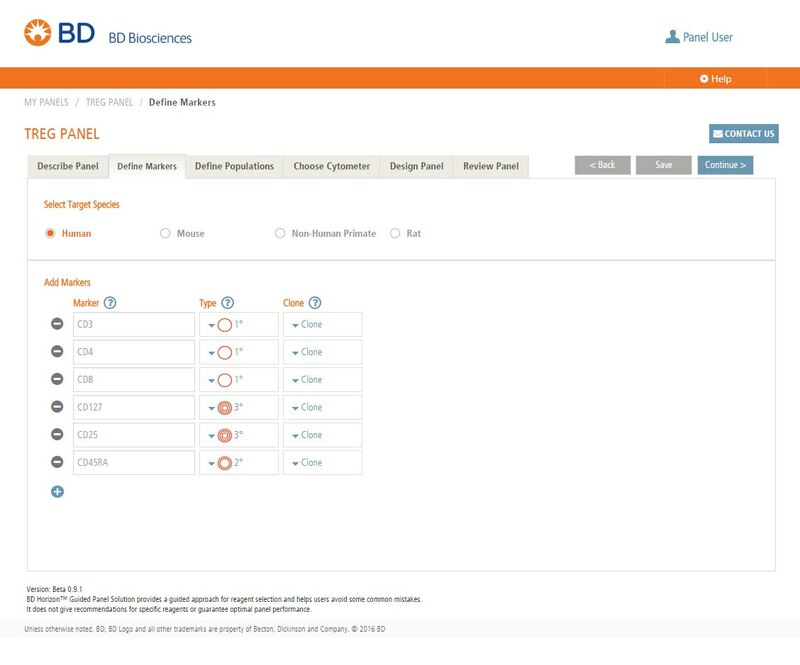 If you have a custom configuration or instrument, select "custom" from the menu and build your instrument according to the lasers and fluorochrome channels available on the instrument. 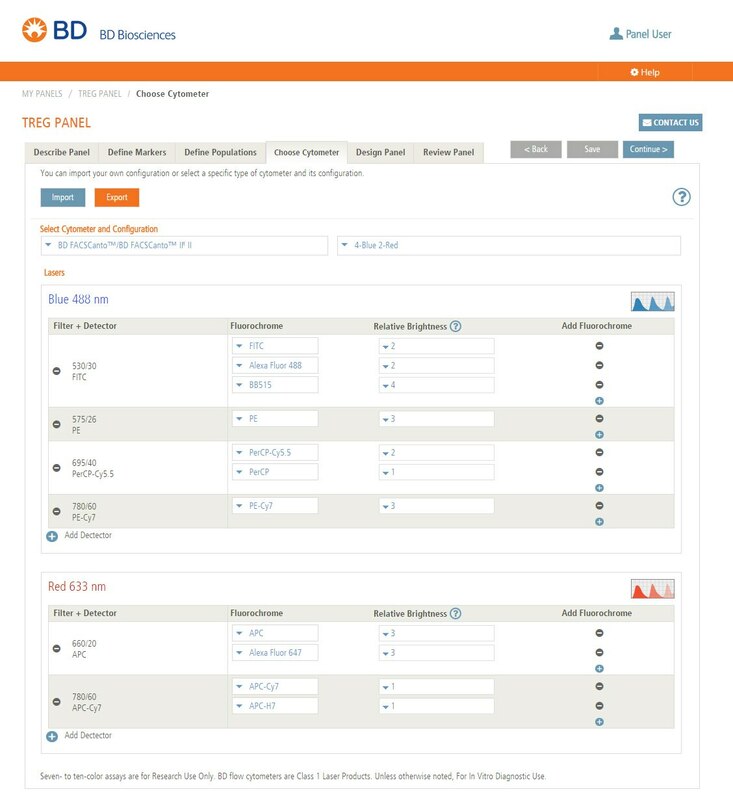 It might be easier to modify an existing configuration to match your custom configuration. To save this configuration for future panels, export the file. The file can then be imported the next time you create a panel. 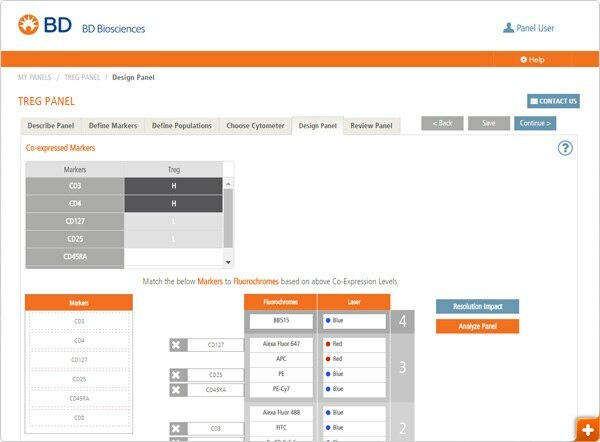 In this step, you will make reagent selections by matching markers with fluorochromes. To do so, drag a marker over to the fluorochrome list. You will notice that many of the flourochromes are highlighted in blue. This designates that the marker/fluorochrome combination is available in the BD catalog. 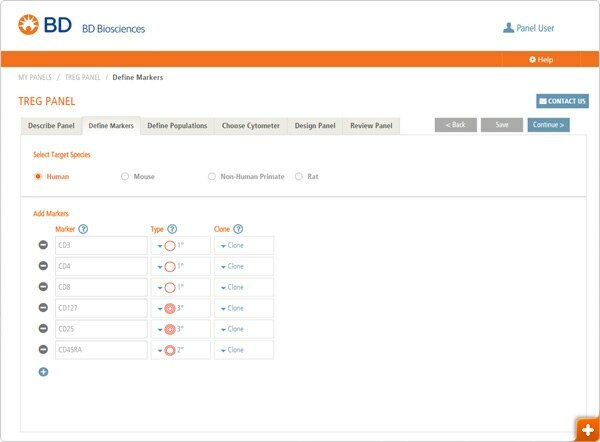 There are features on this page to help with reagent selection. The co-expression table: This table summarizes the information from the previous tabs to denote which markers are co-expressed and to what level. In general, a highly expressed marker should be matched with a dim fluorochrome and vice versa. The relative fluorochrome brightness is noted next to the fluorochromes (Dim-1, Moderate-2, Bright-3, Very Bright-4). If there is a mismatch between fluorochrome brightness and antigen resolution for a reagent selection, the tool will note it with a red exclamation mark. Resolution Impact: A key factor in good panel design is maximizing the resolution of populations, in particular double-positive populations. As shown below, the resolution for a given antigen (fluorescence parameter) is decreased by the spread due to spillover from other fluorochromes. That is, the addition of a reagent may reduce the resolution of another reagent, potentially affecting overall population resolution and data quality. Spread is most important when considering reagents for co-expressed antigens. The Resolution Impact is the percent loss of resolution when a new co-expressed marker/fluorochrome is added. In the example above, the addition of the co-expressed PE marker has reduced the resolution of the PE-CF594 marker by 93% [1-(50/700)x100%]. 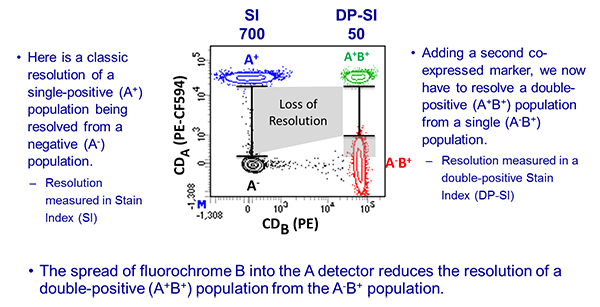 The resolution impact value is based upon markers of equal density and is a way to measure the loss of resolution of a reagent by the addition of another reagent. This Resolution Impact Matrix (RIM) table allows the assessment of the spread introduced to the cells stained with the primary fluorochrome after the addition of the secondary fluorochrome. The resolution is most likely to be impacted when the antigen on the secondary fluorochrome is highly expressed and the antigen on the primary fluorochrome is lowly expressed. The color coding in the table makes it easy to visualize which fluorochromes have the greatest impact on each other. Use this table to decide which fluorochrome combinations are least likely to negatively impact the resolution of the population of interest. Note: The RIM is based on generic instrument platforms and is used for guidance only. The resolution impact of fluorochromes on your specific instrument may differ due to configuration, filters, laser power etc. Analyze Panel: When you click the Analyze Panel button, the tool will perform an assessment of the selected fluorochromes based on the Resolution Impact Matrix and provide alert messages for fluorochrome selections that may reduce critical population resolution due to spread. If an alert is displayed, you may choose different reagent combinations and then click the Analyze Panel button again to see if an improvement was achieved. As the number of markers increases, it may become more difficult to design a panel that has no alert messages. The goal is to maximize resolution of the critical population by minimizing fluorochrome selections that may reduce population resolution. Once you are satisfied with the reagent selections, you can move to the next step. 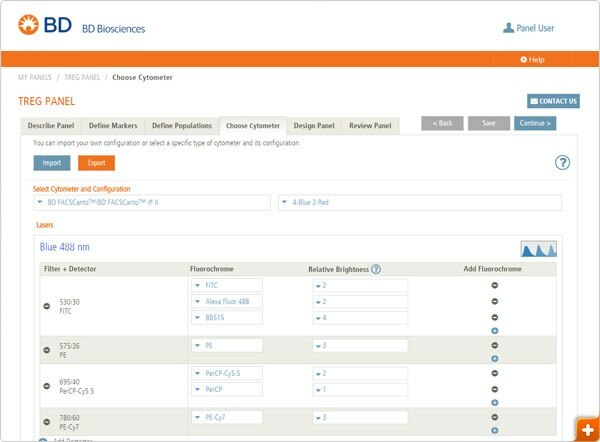 This step displays all of the reagents in the BD catalog that correspond to your panel reagent selections. You can select the reagents you want and then export them to an Excel file by clicking the Export button.